It's the perfect Valentine's Day treat for the Potterhead in your life! Warner Bros. 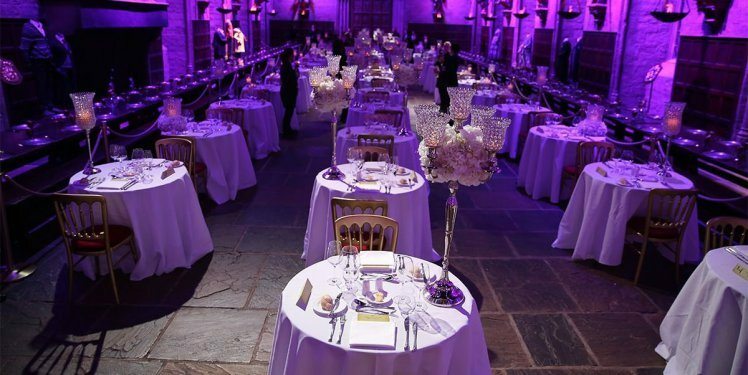 Studio Tour London already hosts Halloween and Christmas-themed dinners, but Valentine’s Dinner In The Great Hall is the most romantic variation yet. Taking place on Friday, Feb. 9, and Saturday, Feb. 10, for a cool $665, you and a date will enjoy drinks, canapés, a “Love Potion” cocktail and a three-course dinner. According to Cosmopolitan, menu choices include pressed chicken terrine or a fig, rosemary and goat cheese tart to start, roast rack of lamb or ricotta gnocchi with chive butter and crispy kale for a main dish, and a sharing plate of desserts with mango and passion fruit delice and a raspberry and amaretto tart to finish the meal. During dinner, you’ll receive a complimentary photo with your date at the table. After eating, you’ll tour the Gryffindor common room, Dumbledore’s office, the Weasley kitchen at The Burrow and the Forbidden Forest. Enjoy a drink on Platform 9 3/4, where you’ll view the original Hogwarts Express train. You’ll also get up close and personal with costumes of film couples Harry, Ginny, Ron and Hermione from the series’ concluding scene, which is set 19 years after the battle of Hogwarts. If all that wasn’t enough, you and your date will continue the tour with some Butterbeer and the chance to wander through Diagon Alley. You’ll conclude the evening with after-dinner tea, coffee and petit fours overlooking the majestic Hogwarts castle model. There's snow place like Hogwarts for Christmas! #HogwartsInTheSnow returns 18th November, and it's never too early to book your tickets! If all this sounds like an ideal Valentine’s Day date for you and your sweetheart, then start saving your money and purchase tickets when they go on sale Tuesday, Dec. 19. The dinner will begin at 7 p.m. and end at midnight. Attendants must be 18 or over. Remember, Warner Bros. Studio Tour London is located just 20 miles northwest of London, so there’s plenty to do after you’ve experienced all that is Harry Potter!